The Geostar hot wedge welder ... “faster, lighter and smarter”. The Geostar has been perfected for civil engineering and takes the proven Leister motto, ‘fast and economical plastic welding’, to a new dimension, says Fabian Beermann, division manager at BMC Gulf, Leister’s sales and service partner in the UAE. “Small, compact, versatile and comparatively lightweight, the new Geostar handles long-distance welding seams without difficulty and even under extreme conditions,” he says. 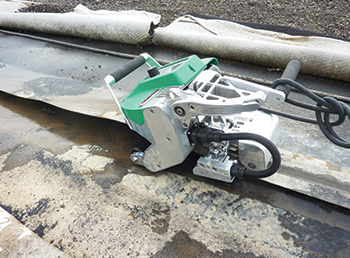 Features such as the rapid welding wedge replacement in less than a minute or the variably adjustable chassis height make it the unbeatable partner for applications in civil engineering, he adds. “The new operating unit (eDrive) provides convenience, efficiency and safety while the large monitor with digital display of joint pressure, speed, wedge welder temperature and integrated voltage display enables permanent monitoring of welding parameters and mains voltage during the work process,” Beermann points out. Generous spatial conditions for the material input were taken into account in the design of the cast aluminium frame in order to accelerate the work process at the start. Additional potential for optimisation was used in the new wedge geometry so that the membranes would glide smoothly over the wedge. “Last but not least, the Geostar also scores points for its ergonomic qualities: one-hand operation, integrated clamp/handle engagement and three parking and maintenance positions supplement the thoroughly thought-out total package,” he concludes. BMC Gulf was established in Dubai in 1998 and is one of the UAE’s leading suppliers for pipes, fittings and valves made of HDPE (high density polyethylene), PP (polypropylene), PVDF (polyvinylidene difluoride) and ECTFE (ethylene chlorotrifluoroethylene) as well as welding machines and equipment for the processing of semi-finished thermoplastics materials.